A wireless access point functions as a bridge between the wired and wireless part of the network. This setup is also often called infrastructure networking. 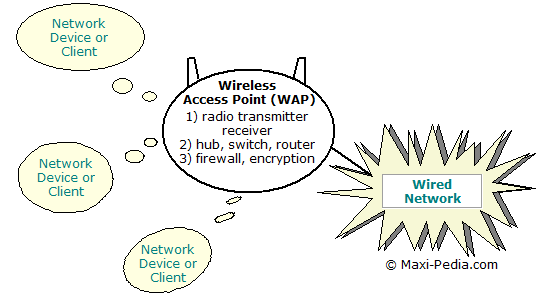 A wireless access point includes a radio receiver/transmitter and antenna. The radio transmitter translates a data stream going from the wired network into radio waves and sends them out to the space. A radio receiver aggregates wireless radio signals coming from wireless-network clients and then translates them into signals to be sent to the wired network. A transmitter/receiver unit is also responsible for some degree of encryption and protection of data using communications and encryption software. The transmitter and receiver are the piers of the bridge on the wireless side; router, switch, or a hub is the first pier of the bridge on the wired side of the network. In case the wireless access point does not contain a hub, switch, or router itself, it usually provides an Ethernet port for a cable connection to a hub, switch, or router on the wired LAN. Wireless access points come in many different flavors. Some have an external antenna, some have built-in antenna, some have built-in routers, some have only built-in hubs, some have only an Ethernet connection and some feature firewalls and other devices. Wireless access points differ also in the level of built-in security features and bandwidth (standards) that they support. The complexity and sophistication of the firewall software that is built into the wireless access point can also make a big difference when shopping for one. How to choose the right wireless access point? You can find more details about that on the next page: How to choose the right wireless router?